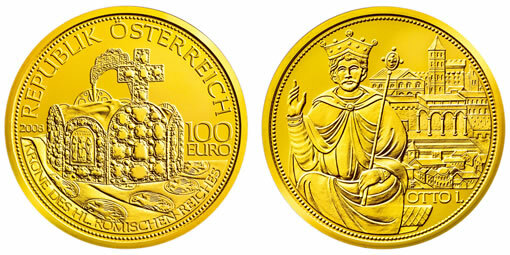 On 5th November, 2008, the Austrian Mint in Vienna launched its new gold commemorative series “Crowns of the House of Habsburg.” The five coin series begins this year with the 1,000 year old crown of the Holy Roman Empire. When the empire of the Caesars in the west sunk beneath the waves of barbarian invasions, it left a ghostly memory of unity and peace among the peoples of Europe and even among the rulers who had replaced it. On Christmas Day in the year 800 Pope Leo III, seeking a powerful protector from his enemies, crowned the Frankish king Charlemagne in St. Peter’s in Rome, thus reviving the imperial title that had vanished three centuries before.. 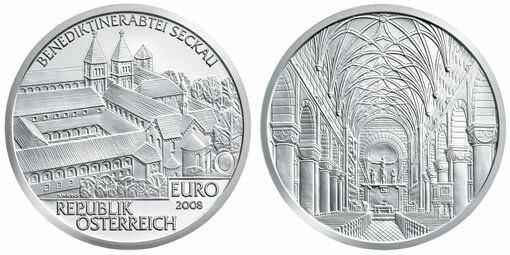 The Austrian Mint in Vienna has issued the last silver 10 euro commemorative in the six-coin series Great Abbeys of Austria. It is dedicated to the Benedictine Abbey of Seckau — a jewel of Romanesque architecture — in the province of northern Styria. Seckau did not begin its existence as a Benedictine foundation. It was founded in 1140 as an abbey of Augustinian canons regular at St. Marein-Feistritz by a nobleman called Adalram von Waldeck – apparently as a penitential act for the death of his cousin. The place proved unsuitable, and in 1142 the abbey was moved to near-by Seckau. A year later Pope Innocent II placed the new foundation directly under papal protection. It was to be a double monastery with nuns (canonesses) from Salzburg forming a separate but adjoining convent. In 1150 they began to build the splendid Romanesque church which we still see today. In 1259 a fire destroyed much of the wooden ceiling and it was replaced with Gothic stone vaulting instead. Austrian Railways Fourth Silver Commemorative, "Empress Elisabeth West Railway"
The Austrian Mint has issued the fourth 20 Euro silver commemorative coin within the "Austrian Railways" six silver coin series. The coin is dedicated to the "Empress Elisabeth West Railway" from Vienna to Salzburg, which was constructed between 1856 and 1860. It features locomotive "kkStB 306" steaming across an iron railway bridge and a superbly crafted scene depicting the platform hall of the West Railway Station in Vienna. In the Austrian Empire the railway lines north to the coalfields and factories of Bohemia or south to the harbour of Trieste and the Adriatic shipping lanes were by far the most important. A railway line from Vienna westwards parallel to the Danube River was of less consequence. However, the Kingdom of Bavaria was very anxious to see such a line between Salzburg and Vienna, which would enable trains from Munich to travel eastwards through Hungary and down to Constantinople. Plans by the government to build such a line were subsequently abandoned in 1856 to a private consortium, the Empress Elisabeth Railway Company. Weighing in at an arm-wrenching 44.2 pounds (20.08 kg) and a gigantic arm-circling 44.6 inches (116.3 cm), the word’s largest silver coin, named the Europe Taler 2008, was unveiled at this year’s European Championship of Football in Austria and Switzerland. Using the current silver spot price of $16.62 per troy ounce, that makes the coin worth about $23,600 in bullion value alone. 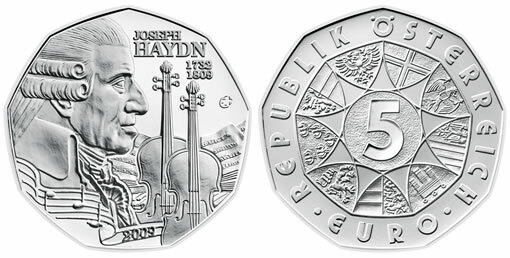 If that’s still a little hefty in price… and in weight for you, smaller coins with nearly 4 ounces (120 grams) of fine silver and a diameter of 2.4 inches (6 cm) will be available soon for the price of € 108 (~$168) plus VAT. The coins will have a limited mintage set to 2,008. As a bonus, packaging of the coin includes "unique pieces from 500-year old wood." 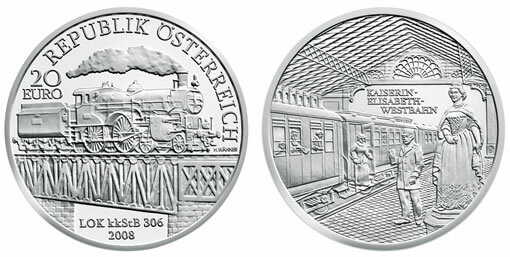 The Austrian Mint announces the June 11 release of the third 20 Euro silver commemorative coin within the "Austrian Railways" six silver coin series. The maximum mintage 50,000 proof coin highlights the “Belle Époque” period, featuring locomotive "kkStb 310" and an elegant lady walking the platform of the North Railway Station with its glass roofing and cast-iron pillars. The “Belle Époque” covers the period of the late 19th and early 20th centuries. It was a time when trains dominated land travel and reached new heights of comfort and luxury for those classes of society which had the money and time to travel. 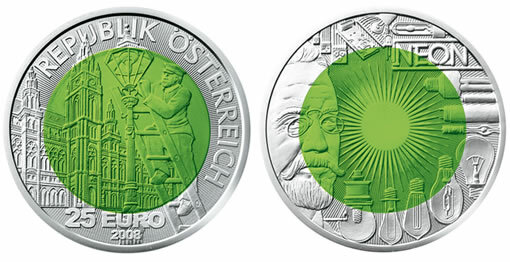 The Austrian Mint in Vienna has released its silver and niobium coin for 2008, which is dedicated to the “Fascination of Light”. Together with water, light is one of the most important factors of life. Without the light of the sun our planet would be cold and dead. The historical occasion for the new coin is the 150 anniversary of the birth of the great Austrian chemist and entrepreneur, Dr. Carl Baron Auer von Welsbach (1858-1929). Among other discoveries Welsbach is remembered for the development of the gas mantle which improved gas lighting in the streets and homes. The gas mantle of 1890 was more robust than earlier methods and produced a “whiter” light.